Brisbane Courier, 3 June 1925, 7. The royal commission’s findings seemed to affirm a perception in Australia that restrictive immigration quotas in the United States were having an adverse effect on the country’s immigration intake and economic conditions. Only a year earlier the U.S. Congress legislated the Johnson­­–Reed Act—an immigration law that was based on national origins and racial categorization. It set numerical limits on immigration from southeastern Europe to a two percent quota based on the U.S. 1890 census. A period, so thought U.S. nativists, when the sources of European immigration shifted, altering the racial homogeneity of the nation. As historian Mai Ngai notes, the Johnson­–Reed Act was the nation’s first comprehensive immigration restriction law. Unlike previous forms of immigration restriction, which sought to bar the entry of Chinese people, other Asians, and people deemed to be vagrants or criminals, the Johnson–Reed Act was based on a global racial and national hierarchy that favored some immigrants over others. Immigrants from northwestern Europe were to be encouraged, while inflows from southeastern Europe were stemmed and non-Europeans were, by-and-large, prohibited. Only a year after it was legislated, as the conclusions of the Queensland royal commission suggest, the Johnson-Reed Act had begun to impact the migratory patterns of people from the Mediterranean region. 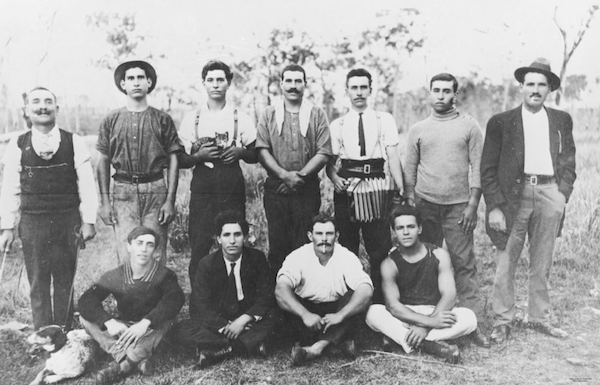 Unable to easily reenter the United States, some people, Lucas and Cousodamos among them, made their way to Australia. Although numerically small their arrival raised particular transpacific concerns. 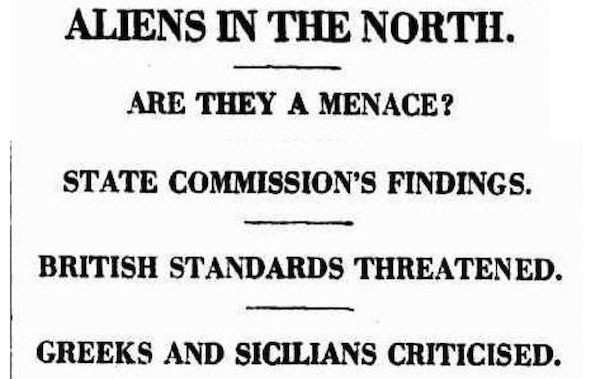 “Immigration Restriction,” Sydney Morning Herald, December 29, 1925, 13. Goethe’s words testify to the reach of transnational identifications with whiteness. The “menace” of immigration from southeastern Europe, so thought Goethe, was both a U.S. and an Australian problem. His use of the term “four great Nordic nations” revealed a common feeling of race history was shared between the U.S., Canada, Australia, and New Zealand. These countries, as historians Marilyn Lake and Henry Reynolds have highlighted, saw themselves as “white man’s countries.” An idea that emerged in the context of nineteenth-century imperialisms and migrations that saw millions of people from China, Europe, and India move to new locations around the world. A significant proportion of these migrants settled in southern Africa, the Americas, and Australasia, to lands taken by force from First Nation inhabitants. Modern migration to the “four great Nordic nations” rested on conquest, colonialism, and displacement. These nations were British, or (in the case of the United States) ex-British, settler-colonial societies. They were societies that shared remarkably similar understandings of national space, civilizational origins, and power dynamics associated with labor exploitation and racial classifications. Underlying this similarity was the perception that lands in long-term use by First Nations peoples were empty or unused. Through the processes of settler colonization, race-making, and capitalist exploitation the lands of First Nations peoples were carved up into commercialized packets of private property for new settlers—for people that came to stay. From the nineteenth century onward, a steady stream of Greeks lived and worked in the settler-colonial societies that faced the Pacific Ocean. These Greeks were precariously classified as white-but-not-white-enough within the operations of race and labor that underpinned the power dynamics of settler-colonialism. At one level, non-English-speaking Greeks—peoples alien in language and culture—were positioned as inferior and unwelcome settlers. At another level, Greeks—as the supposed inheritors of classical antiquity—bestowed upon settler-colonial societies a civilizational exemplariness. Their cultural heritage contributed to the colonizing authority’s sense of superiority over previous inhabitants. Greek people were seen as white because of their civilizational heritage and generative claim to European origins. Yet, because of eugenic racial thinking that racially categorized people from the Mediterranean region to be a lower subset of the archetypal white-European race, Greeks were simultaneously positioned as raciallydistinct from other whites. They were outside-yet-firmly-within the structure of settler colonialization—an ongoing process that is much more than a historical event. Tied to this ambiguous experience of racial marking, as the parallel Greek immigration histories of the United States, Canada, and Australia demonstrate, are experiences of work, community building, and family life. Through the processes of chain migration, able-bodied “pioneers” crossed the Atlantic and Indian oceans and began to adapt to life in their host countries. In mining hubs in Western Australia and Colorado, and across urban centers in Melbourne, Philadelphia and Toronto, labor was sold, businesses were established, properties were bought, churches were built, couples were betrothed, and remittances were sent back to homelands. Over time, Greeks—as hard-working miners, kitchenhands, bootblacks, fishermen, farmers, and storekeepers—came to acquire a sense of permanent belonging. Historical narratives of Greek immigration exclusively foreground stories of sacrifice, perseverance, and hardship. They expose how Greeks became integrated within the nation while maintaining Greek culture abroad. Such immigration narratives have become normalized within the public historical consciousness of the United States, Canada, and Australia. Stories of “struggle” and “success” have become commonplace within the multicultural ethos of the contemporary nation. By moving from ports of entry to suburban streets, Greeks ultimately obtained the privileges of national inclusion. Greek migrants, as the corresponding immigration narratives proclaim, became successful inclusions. They became Greek Americans, Greek Australians, and Greek Canadians. While such historical narratives have importantly contributed to our understanding of the early modern Greek migration experience, the narrative of Greek migrant struggle and success has been predominantly confined to narrow stories of the nation. What is more, narratives of struggle and success have often masked when and how Greek migrants consented to the stigmatization of other racialized minorities and that this historical silencing was ultimately a function of acquired Greek ethnic privileges. Such commonplace narratives have, in my view, avoided asking some important historical questions. What if we were to reframe the historical experience of Greek migrant struggle and success? What if the corresponding stories of Greek migration to the United States, Canada, and Australia were understood not independently from each other, but as an interconnected history? What if we were to explore moments when struggles persisted and the aspiration for upward socioeconomic mobility was not obtained? What if narratives of Greek immigration were evaluated as interlinked with histories of colonialization? What if Greek geopolitical mobilities (in their varied forms) were seen to be part of wider transimperial (Ottoman, British, French, American), transnational (Greece, Egypt, Canada, Australia), or transoceanic (Mediterranean, Atlantic, Indian, Pacific) processes of movement and exchange? What if the movement of Greek peoples, texts, architecture, and attitudes were viewed as mutually informed by the intersecting global phenomena of imperialism, capitalism, and nationalism? Such questions have foregrounded my approach to historical injury and are guiding my current project, entitled, Greek Settler Colonialism: A History. In addressing such questions, I believe that we are prodded to move away from edifying, civilizing, and celebratory stories of Greek migrants contributing to particular nation-building agendas. We are pushed to frame migrant crossings—say between the Port of Piraeus and Ellis Island, or Port Said and Port Melbourne—as colonial crossings. Migrant crossings that, in other words, weaved across imperially imposed borders, territories, and social structures. We are probed to consider how modern Greek mobilities entered onto deeply layered landscapes inhabited by First Nation peoples—landscapes that have their own precolonial and enduring senses of origin, history, and belonging. Such questions reorient and broaden our historical gaze. They bring the historical phenomenon of colonization into conversation with the historical phenomenon of modern Greek migration. By addressing such questions, I am of the view that we can reinterpret what Charles C. Moskos, Jr. labelled in 1980 as the “remarkable” ability of Greeks in America to comfortably accommodate to the achievement standards of the larger society. Let us consider this archival photograph, taken toward the end of World War I, from the State Library of Queensland. Posing for the camera are casually dressed migrants in Childers, Queensland. They are the type of people that would have been questioned and assessed by the Queensland royal commission in 1925. All, except three, are cane-cutters from the Ionian island of Kythera. An island, as both Thomas Gallant and Sakis Gekas have explored, that was for a large portion of the nineteenth-century part of a British colonial dominion in the Mediterranean. In other words, the fathers and grandfathers of the men in the image would have lived within a British imperial domain that was connected, via the routes of empire, to the cane farm they were working on. By considering the transimperial context of these migrants’ lives, we can accordingly view these Greek cane-cutters as enmeshed within a system of British colonial networks–networks that facilitated movements and exchanges between the Mediterranean and the Pacific. Gazing firmly at the camera, the men conspicuously flaunt their presence on the landscape. At first glance, the photograph exemplifies a specific kind of performance. The laborers with rolled-up shirt sleeves—one is even wearing a singlet—showcase their working bodies. The experience of arduous, dirty, and physically taxing labor associated with seasonal cane-cutting is rendered visible. One member holds a kitten in his arms, another holds an accordion—a nod to the transnational circulation of Greek musical folk traditions. From an initial viewing we may be inclined, if not encouraged, to see this moment as a story of Greeks negotiating an embryonic Australianness. As contributors to land cultivation, we might view these men as participating in Australian economic progress. Their contribution could be considered as tied to the Australian frontier lore of self-sufficiency and mateship. In this light, we can interpret this image as a snapshot of Greek migrants struggling and succeeding—surviving and progressing—in a new land. But what if we consider the image through the lens of colonialism? What if we, at a second glance, consider the land and its relation to colonizing practices of nation building in the background of the photo? How would our interpretation of the image change? It is more than likely that this cane-gang cleared and worked the land behind them, land traditionally inhabited by the Dundaburra peoples who are part of Kabi Kabi tribes of the region. The Dundaburra, as historian Raymond Evans informs us, would have spoken one of at least ninety indigenous languages and dialects that were in use across the landmass that we now call Queensland. A landmass that, after the emancipation of slavery, was dreamt as having the potential to act as a new plantation society. First Nations peoples, like the Dundaburra, were moved off their lands and a profit-driven economy was created. Unskilled South Sea Islander laborers, along with other nonwhite indentured laborers, were (through violent means) recruited on and then deported off the land. The land and its resources, upon which material wealth was based, had been taken. Invasive laws, lives, and labor radically reconstructed the environment in image. In this sense, after a second viewing, we can view the Greek cane-gang as posturing in an environment that is scarred by the colonial intrusion of their presence. They are laborers that, due to British colonial rule on the Ionian Islands, would have held a particular colonial mindset. A mindset that identified with the civilizing mission of the empire and simultaneously questioned the methods of British colonialism (both in the Mediterranean and Australia). In this sense the men are also laborers that have served, and are serving, settler-colonial interests. They are participating, in the words of the late Pacific historian Tracey Banivanua-Mar, in the removal and forgetting of First Nation and South Sea Islander peoples. Through deeper historical observation we can view this image of Ionians on Dundaburra land as a culturally specific representation of settler-colonial intrusion. With this in mind, our understanding of Greek migration is altered. Greek migration becomes a facet of settler-colonialism and not merely a story of adaptation and contribution in a new land. The southern European “immigration problem,” as espoused by Goethe and investigated by the Queensland royal commission, can now be understood as a transnational phenomenon of early-twentieth-century Greek mobility and a transpacific story of Australian and U.S. identifications with whiteness. I am of the view that this reframing can be productively applied to our historical understandings of the modern Greek migration. Through a settler colonial lens, for example, we are able to reevaluate how Greeks in the United States engaged and resisted unregulated capitalism in the American West. We can reassess the laboring efforts of Greek miners—some of whom arrived from imperial centers in the Ottoman empire—as part of ongoing processes of settler colonialism in Utah and Colorado. We can consider how the renumerations that Greeks received for their labor—renumerations that were often used to open stores in rapidly urbanizing cities—were made possible due to the systematic seizure of lands inhabited by the First Nation peoples during the nineteenth century and the violent assimilationist practices experienced by First Nation peoples in the twentieth century. Simply put, we can view Greek laboring in the American West as directly (and indirectly) cocontributing to the historical phenomenon of American settler colonialism and industrial capitalist expansion. Seeing Greek migration through the lens of settler-colonialism has the potential to enhance how we understand Greek migrations—migrations that moved across imperially imposed borders and through the cross-cultural spaces of empires and nations. By bringing historical understandings of settler colonialism into conversation with historical narratives of Greek migration, we can avoid ignoring the role that Greek migrants played in the unwarranted dispossession of indigenous lands. In having this uneasy conversation, we can develop a more wholesome interpretation of how Greeks struggled and succeed in the United States, Canada, and Australia. We can begin to view Greek settlement and assimilation in new lands as historically tied to the story of European conquest and colonization. By viewing Greek migration as facet of settler colonialism, I believe that a fuller and more historically honest interpretation of Greek migrant struggle and success can be reached. Dr. Andonis Piperoglou is a Lecturer in History at the Australian Catholic University and a Research Associate in History at Flinders University. He specializes in Australian migration and ethnic history, particularly Greek migration to Australia during the first half of twentieth century. His work has been published in the Journal of Australian Studies, the Australian Journal of Politics and History (forthcoming), and the online media outlet New Matilda. He is currently working on his first monograph provisionally titled Greek Settler Colonialism: A History, a project that emanates from his doctoral work on the making of an early Greek-Australia and the racialized politics of labor across the British Empire, Greece, the United States and Australia. Anagnostou, Yiorgos. Contours of White Ethnicity: Popular Ethnography and the Making of Unstable Pasts in Greek America. Athens OH: Ohio University Press, 2009, 13. Banivanua-Mar, Tracey. Violence and Colonial Dialogue: The Australian-Pacific Indentured Labor Trade. Honolulu: University of Hawaii Press, 2007, 175. Christopher, Emma. “Dreams of a New Plantation Society: Legacies of British Slavery in Queensland, Australia.” Blog of the Legacies of British Slave-ownership project, University College London, July 25, 2018. Evans, Raymond. A History of Queensland. Cambridge, U.K.: Cambridge University Press, 2007, 3. Ferry, Thomas Arthur. Report on the Social and Economic Effects of Increase in the Number of Aliens in North Queensland. Royal Commission of the Government of Queensland, Brisbane: Government Printer, 1925. Gallant, Thomas. Experiencing Dominion: Culture, Identity and Power in the British Mediterranean. Notre Dame, Ind. : University of Notre Dame Press, 2002. Gekas, Sakis. Xenocracy: State, Class, and Colonialism in the Ionian Islands, 1815–1864. New York: Berghahn, 2016. 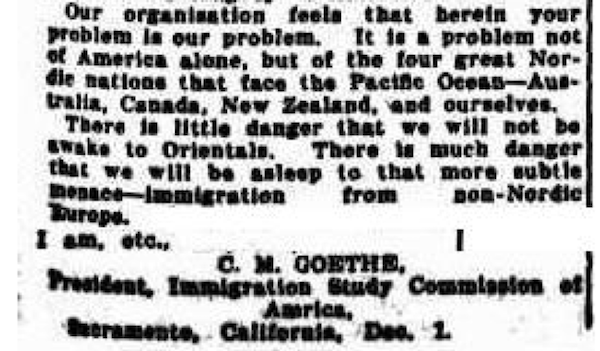 Goethe, Charles M. “Restriction of Immigration.” Sydney Morning Herald, December 29, 1925, 3. Origins: Immigrant Communities in Victoria. “History of Immigration from Greece.” Immigration Museum (Melbourne), Museum Victoria Australia. Kourelis, Kostis. “From Greek Village to the American City: The Archaeology of Immigration.” Franklin & Marshall Magazine, Summer 2016, 86. Lake, Marilyn, and Henry Reynolds. Drawing the Global Colour Line: White Men's Countries and the International Challenge of Racial Equality. Cambridge, U.K.: Cambridge University Press, 2009, 6. Moskos, Jr., Charles C. Greek Americans: Struggle and Success. Englewood Cliffs, N J: Prentice-Hall, 1980, 2. Nagata, Judith A. “Adaptation and Integration of Greek Working Class Immigrants in the City of Toronto, Canada: A Situational Approach.” International Migration Review, 4 (1), 1969, 44–70. Ngai, Mae M. Impossible Subjects: Illegal Aliens and the Making of Modern America. Princeton, N.J.: Princeton University Press, 2005, 3. Roediger, David R. Working Toward Whiteness: How America’s Immigrants Become White: The Strange Journey from Ellis Island to the Suburbs. New York: Basic Books, 2005, 108. Wolfe, Patrick. “Settler Colonialism and the Elimination of the Native.” Journal of Genocide Research, 8 (4), 2006, 388. Yiannakis, J N. “Kalgoorlie Alchemy: Xenophobia, Patriotism and the 1916 Anti-Greek Riots.” Early Days: Journal of the Royal Western Australian Historical Society , 11 (2), 1996, 199–211.